Elucidating the mechanisms by which nervous systems process information and generate behaviour is among the fundamental problems of biology. Ultimately, it is desirable to understand these processes at the most basic level, that of molecules and cells. We are investigating these questions using the nematode Caenorhabditis elegans, which has an anatomically simple and well-defined nervous system and is tractable to molecular and classical genetic analysis. Using recently developed methods for in vivo optical neuroimaging, we are investigating how the activities of individual neurons correlate with behaviour, and how genes with interesting behavioural phenotypes affect the activities of individual neurons in defined neural circuits. 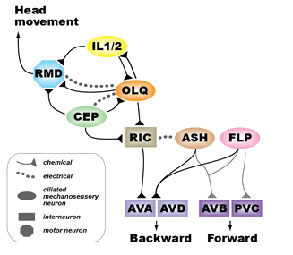 In particular, we are interested in circuits mediating avoidance responses to touch and noxious chemical stimuli. We are also investigating how behavioural plasticity caused by learning or chronic exposure to drugs is mediated at the level of individual cells. Finally, we are interested in developing machine vision approaches for the rapid and consistent quantitation of behavioural phenotypes, which we plan to use for genome-wide phenotypic studies of C. elegans behavioural patterns. Plos Comput Biol 12(12): e1005283. 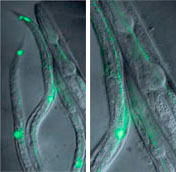 tmc-1 encodes a sodium-sensitive channel required for salt chemosensation in C. elegans. A dictionary of behavioral motifs reveals genes affecting C. elegans locomotion. Proc Natl Acad Sci USA 110: 791-796. Lateral facilitation between primary mechanosensory neurons controls nose touch perception in C. elegans. Specific roles for DEG/ENaC and TRP channels in touch and thermosensation in C. elegans nociceptors. Functional asymmetry in C. elegans salt taste neurons and its computational role in chemotaxis behaviour.